We’d love your help. Let us know what’s wrong with this preview of Last Snow by Eric Van Lustbader. The electrifying follow-up to the Jack McClure thriller First Daughter from the New York Times bestselling author of The Bourne Sanction and The Bourne Deception. To ask other readers questions about Last Snow, please sign up. When a senator is killed on the island of capri, when he was supposed to be in The Ukraine, dyslexic genius Jack McClure is on the case. Along the way, he gathers a bit of a hare, The POTUS's daughter, and lovely Russian agent. Of course he follows the chain of corruption to the top echelons of power. I was tempted to abandon this book after about 60 pages. But I kept at it until I finished it. Wish I had gone with my first impression. The focus of the book seems somehow irrelevant to the overall background of the book. This book was plodding, and at the end, I found myself simply bored with the many intertwining characters, many of whom I simply did not care about. The book deteriorated into exposition, finding it necessary to explain subplot after subplot in excruciating detail rather than moving the main plot along to conclusion. I found myself skimming much of the final pages just to get to the end of the book, which I almost never do. Too many details done wrong - "pizza with pepperonicci" (this from Pappa This book was plodding, and at the end, I found myself simply bored with the many intertwining characters, many of whom I simply did not care about. The book deteriorated into exposition, finding it necessary to explain subplot after subplot in excruciating detail rather than moving the main plot along to conclusion. I found myself skimming much of the final pages just to get to the end of the book, which I almost never do. Too many details done wrong - "pizza with pepperonicci" (this from Pappa John's in Washington DC according to the book), an almost sudden death by "arsenic", duh, arsenic is a heavy metal and death, like lead takes months to manifest. If the details can't be done right, and the book is boring and its conclusion bynzantine, there's not much in for most thriller readers. The characters are not believable and the reader is forever pulling back, questioning their authenticity which makes for unsmooth, jerky reading. A guilt-ridden dyslexic main character who sees visions (Are they? We never know) of his dead daughter; a Graves disease suffering daughter of the US President; a beautiful and lethal Russian agent with carnelian eyes. I asked an opthalmologist-He's never seen carnelian color eyes. The setting is Russia, but the novel's Russian characters speak not only perfect English, "Gurov shrugged, 'Six feet under, I imagine. We required verisimilitude.'" Yeah, I can just hear Gurov saying that. The names, as in any Russian novel become confusing, but that is expected. Mr. Van Lustbader attacks conservatives, neocons and a person born out of "entitlement" throughout the book. Smart way to allienate 50% of American readers. I guess I'll save my capitalist dollars on any future Van Lustbader novels. 1) This book is a follow-up to his novel "First Daughter." In that book, Agt. Jack McClure saves Alli Carson, the daughter of the President from a kidnapper. Much of this book draws from the previous novel. If you never read "First Daughter" certain preferences might be oblique to the reader. 2)We are asked to believe that this agent is allowed to take Alli on a dangerous, secret mission to Russia because her mother says it's ok. Really? 3) McClure is dyslexic and because of that disability he sees things in 3D. Again,really?? I asked my dyslexic friends about this and none of them see in 3D. Does that mean that the ghost(yes,ghost)of his daughter is also seen in 3D? 4) There are more characters in this novel than in a Russian phonebook. Many of the names are similiar enough to each other that it is easy to get confused. I loved this book! It is the best thriller/political intrigue I have read in a long time. Never had it figured out because of all the layers built into the story. There was a big shock at the very end. I will probably go a read First Daughter as a lot of the same characters were in this book. Last Snow is what a thriller should be: Tense, engaging and with enough solid characterization to make you care what happens to the people about whom you're reading. I really had to think through this whole book thanks to all the twists and turns and new revelations coming around every corner. The main character, Jack McClure, is a close confidant of newly seated president Carson. He's also dyslexic, which apparently gives him a unique ability to piece together some pretty far-flung clues to come Last Snow is what a thriller should be: Tense, engaging and with enough solid characterization to make you care what happens to the people about whom you're reading. I really had to think through this whole book thanks to all the twists and turns and new revelations coming around every corner. The main character, Jack McClure, is a close confidant of newly seated president Carson. He's also dyslexic, which apparently gives him a unique ability to piece together some pretty far-flung clues to come up with an answer. I'm not sure how much I believed this particular portion of the story, but I was easily able to suspend my disbelief and just pretend that Jack was really, really good at what he did. I liked Jack a lot. He had just the right balance of tough-guy exterior and soft-heartedness to strike me as being a real person. Characterization, to me, is one of the main faults of thrillers, which tend to be so plot-heavy that the authors don't take enough time fleshing out their characters to satisfy my liking. Not with this book. I was able to get a real sense for not only Jack and the other main characters, but also some of the more minor characters. He simply did not know any other way to live, if this was living at all, which he'd begun to seriously doubt. And therein lay the rub, as the good Bard wrote, he thought, because the only thing to fear was doubt. He knew from his mentors that the moment you allowed doubt to creep into your thinking -- doubt about your ability, about the people around you, about the dark and gravelike profession you were in -- you were as good as dead. The plot was also very interesting. What started out as one mission for Jack turned into something else entirely, and every step of the way made sense in the end. There were times when I could barely read fast enough to find out what was going to happen next. And the ending. Wow. Talk about a punch in the gut that you don't see coming. You think the book's going to end one way, but then something else completely happens and you're left stunned. I'm still not totally sure if I'm pleased with the ending, but I will say it was not one of those neatly-tied-up-with-a-bow kind of endings where all the bad guys are in jail and the good guys will fight crime another day. Another little thing I liked, just because I'm a nerd like that, was that each of the three parts of the book opened with a literary quote -- two Shakespeare and one Edmund Spenser -- and there were literary references sprinkled throughout the novel. Every time I'd see a work I know referenced, I would smile a little bit, but that's just me. If there's one criticism that I had about this book, although it didn't take away from my enjoyment of the book at all, is that every single character seemed to have some kind of tragic or checkered past. Everyone had experienced some kind of unspeakable event or heartbreak, or had a family member with a major illness or disability. While I understand this is what helps a lot of readers relate to the characters, I just couldn't help but wonder if there were any people in Jack McClure's world who hadn't experienced anything catastrophic. I haven't even finished it. Boring, too many stereotypes. Having been disappointed by Linda Fairstein’s Terminal City and Lee Child’s Personal (Jack Reacher), I was really looking forward to (and desperately needed) a new author. So, the US President’s trusted aide, Jack McClure, is dispatched to the Ukraine to find out how and why a US senator was murdered. He ends up being saddled Having been disappointed by Linda Fairstein’s Terminal City and Lee Child’s Personal (Jack Reacher), I was really looking forward to (and desperately needed) a new author. So, the US President’s trusted aide, Jack McClure, is dispatched to the Ukraine to find out how and why a US senator was murdered. He ends up being saddled with the First Daughter and a rogue Russian agent. Those three alone are fine, actually, with many redeeming characteristics – each has been damaged by their pasts (Jack’s dead daughter was best friends with Alli, the First Daughter; Russian agent Annika has a past whose layers are peeled back like an onion). Then there’s a dizzying array of US, Russian, and Ukrainian characters, some with back stories, some without. The plot itself, about Russia’s interests in the Ukraine was interesting to me precisely because of Russia’s annexation there in the recent past. Add in US interests in the region and it made for an interesting geopolitical exploration – if you like that sort of thing. I could tolerate it, I must say. However, for me, the dialogue is very wooden – at one stage, an American woman utters that most Jeeves and Wooster phrase: ‘You unspeakable toad!’ Seriously, how likely is that. And that is just the tip of the iceberg with the dialogue – there were whole phrases and sentences that just didn’t flow as natural dialogue at all. And, yet, I kept reading. As any creative writing class will tell you, you must make the reader care about the characters and it was that trinity – Jack, Alli, and Annika – who sustained my interest. But only for them, I would have quit half way through. Not a repeat author for me, I’m sorry to say. The story was OK, but the writing! At times it was so bad that it lifted me completely out of the story. I would read something and think, "I can't believe I just read that. Was it a mistake? No, it looks like that's what he meant to say. Is this his first book? No, and OH MY GOD! The Ludlum Estate chose this guy to carry on the Jason Bourne novels??!! No way!!" And then I'd read some more and then, Wham! Another ridiculous, trite, romance novel cliche would slap me in the brain, taking me out o The story was OK, but the writing! At times it was so bad that it lifted me completely out of the story. I would read something and think, "I can't believe I just read that. Was it a mistake? No, it looks like that's what he meant to say. Is this his first book? No, and OH MY GOD! The Ludlum Estate chose this guy to carry on the Jason Bourne novels??!! No way!!" And then I'd read some more and then, Wham! Another ridiculous, trite, romance novel cliche would slap me in the brain, taking me out of the story. It was so bad that I marked passages for this review. Unknowingly - this was book two in the Jack McClure series. It's very involved and reminds me of Robert Ludlum. But Lustbader is a great writer and enjoyed it very much. This is another truly great thriller and I've read quite a few over the past 3-4 years since I retired. It's fast paced, seductive, swift moving and and a provoking book but Eric Lustbader went over the top with this one. It has an ending that I wasn't prepared for. I just finished it tonight (11:57pm) but I'm going to re-read the last chapter again right now!!!! Problem: What do I read now that can top this one? Disappointed since jacket had a Lee Child quote endorsing this story. There were too many unbelievable twists and turns and it seemed he kept adding things that didn't move the story along. It was a quick read and kept me in suspense but it was too much for me to believe. Two busy with too many plots and sub plots. Hard to get into it. Last Snow, Eric Van Lustbader’s new political thriller, picks up right where First Daughter left off. Edward Carson is now the President. First daughter, Alli, is recovering from her kidnapping ordeal, and Jack McClure is still talking to his dead daughter. The President is in Russia, negotiating an arms deal, when an important administration ally turns up dead. President Carson is counting on Jack to untangle a web of lies and keep Alli safe — which would be easier if he had some idea who was a Last Snow, Eric Van Lustbader’s new political thriller, picks up right where First Daughter left off. Edward Carson is now the President. First daughter, Alli, is recovering from her kidnapping ordeal, and Jack McClure is still talking to his dead daughter. The President is in Russia, negotiating an arms deal, when an important administration ally turns up dead. President Carson is counting on Jack to untangle a web of lies and keep Alli safe — which would be easier if he had some idea who was after them. Jack McClure is an interesting character. In First Daughter, we learned that he managed to make a name for himself in the intelligence community in spite of — or perhaps because of — his dyslexia. In this environment, his mind works in a completely original way: every walk through a building creates a three-dimensional map in his head, he seems able to assemble tiny fragments of information into a coherent picture at blinding speeds. I’m not sure that dyslexia has this effect on everyone, but it works for Jack. The plot is a Gordian knot. Everyone is lying, there is no clear view of the big picture, and everything is handled in secrecy. That’s to be expected, since Jack has hauled the President’s daughter on a cross-country dash to stay one step ahead of hired assassins — and those assassins might not all be Russian. There’s a chance there is a traitor close to the President and he may have Jack and Alli in his sights. I love a good political thriller. I had fun trying to scout the angles in this one, trying to sort out the post-Cold-War political influences that motivated the players. Throw in the possibility of a traitor amongst the President’s advisors, and you’ve got plenty of intrigue to work with. You could almost see the clock ticking down, feel the tension, right up to the signing of the accord, with agents working frantically in the background. I really enjoyed the big build-up. I’m still not sure how I feel about Jack’s conversations with his dead daughter. It’s strangely out of place in a serious political thriller — like finding out one of the ATF agents is a werewolf or something. But it doesn’t seem entirely out of place. She’s not revealing the secrets of the universe to him or stopping bullets; she could be a manifestation of his grief. It adds just a touch of the exotic to the standard formula, and I like that very much. There are some big twists in Last Snow, the sort of twists that make you wonder about the next book. If Jack’s story continues — and I have no reason to think it won’t — things are definitely going to change. I look forward to checking out the new landscape. Although I hadn't read anything from Van Lustbader before, I was encouraged to like him knowing that he took over the Bourne series by Robert Ludlum. I thought; Oh, if he did Jason Bourne justice, this will be good! The story started slowly. There was a lot of background needed and I suppose its fair to say that that weighs down the beginning of just about every book. However, it moved slow enough that I could easily dissect characters into their stereotype and follow cliche behavior to inevitible conclusions. By the half-way point I was nauseous. There was even a particular point when Alli and Jack were having a conversation about her mental state that was so scripted and unrealistic that I wasn't sure if I could continue reading. Then things changed drastically! The second half was very good! The cliches ended and the plot started unfolding in interesting ways instead of pursuing a bluntly obvious course of events. It was too late, by then I had guessed pieces of the outcome (like who was behind it all.) Amazingly, even knowing the major components of the ending didn't ruin the journey getting there! I enjoyed the process! I must say that the author's overuse of some words, most singularly the word "smear", grated on me throughout. Overall, a good quality story, albeit with severe flaws. This book was rife with action. It starts off with Edward Carson settling into his position as President. He is in meetings with Russia, and receives information that one of his Senators has been killed in Capri. The news comes as a surprise to him as the Senator wasn't even supposed to be in Capri, so he sends Jack McClure to find out why he was there, and why he was killed. Was it an accident, or was it intentional? Needless to say, Jack sets off on a race against time, and picks up a few stra This book was rife with action. It starts off with Edward Carson settling into his position as President. He is in meetings with Russia, and receives information that one of his Senators has been killed in Capri. The news comes as a surprise to him as the Senator wasn't even supposed to be in Capri, so he sends Jack McClure to find out why he was there, and why he was killed. Was it an accident, or was it intentional? Needless to say, Jack sets off on a race against time, and picks up a few stragglers along the way. The plot was definitely complex, and I found that Van Lustbader used sleight of hand throughout the book. It was easy to see what the right hand was doing, but then out of left field some new dilemma or information was thrust on Jack. He then had to weigh all of the factors together, in the way only he can. The web of lies, and half-truths were so intricately wound throughout the story, that you didn't know whether certain people were allies or foes. The character development for both Jack and Alli was unbelievably good as well. We delve more into the mystery behind the psychological repercussions of Alli's abduction, and we see the bond between her and Jack grow stronger. I will say that there were a lot of new characters, almost too many. But, when he reached that point, once a character outlived his usefulness, he or she was gone. Van Lustbader had no problem killing off characters. Recommends it for: Political thriller Fans with a high tolerance for irrelevance in a story. Should most likely be rated at 2.5*. The first half is well written and interesting. The second half drags as Lustbader subjects the reader to long stretches of uninteresting dialogue and sub-plots that only tangentially relate to the main story. The ending is totally disappointing as if the author said to himself, "It's time to wrap this up and I have to do it in 10 pages or less." Jack McClure, Special Advisor and closest friend to the new President of the United States is dyslexic and sees the Should most likely be rated at 2.5*. The first half is well written and interesting. The second half drags as Lustbader subjects the reader to long stretches of uninteresting dialogue and sub-plots that only tangentially relate to the main story. The ending is totally disappointing as if the author said to himself, "It's time to wrap this up and I have to do it in 10 pages or less." Jack McClure, Special Advisor and closest friend to the new President of the United States is dyslexic and sees the world differently - able to conceptualize and problem solve in three dimensions which is an asset in most situations but a liability in others. The story starts with a murdered American Senator who's killed on the Isle of Capri when he's supposed to be in the Ukraine. The President dispatches McClure to find out why. Struggling with coming to terms with the death of his daughter and the dissolution of his marriage, he, accompanied by Annika Dementieva, a rogue Russian FSB agent, and Alli Carson, the President’s daughter, heads to Kiev. On the way he finds himself pursued by the Russian mafia, the Ukrainian police, the FSB and his own NSA. Eventually he realizes he is totally surrounded by corruption and lies. Using his unique skills he figures it all out and saves the President from a major political embarrassment. What follows is a melodramatic ending that, while tying up all the loose ends left me deflated. Some of it made sense, a lot of it didn't. Most of the last few pages felt rushed and anti-climatic. Maybe Lustbader was trying to meet a deadline. Special advisor to the President, Jack McClure, finds himself in Moscow with the president and his family working on an important treaty when word comes that a senator has died in Capri. Strange thing is, this senator was supposed to be in the Ukraine. Sensing something is wrong, the president sends Jack McClure off to investigate. Before he can leave, a strange run in with a Russian woman named Annika stirs the pot and gives him a partner. Throw in the first daughter, Alli, deciding to tag alon Special advisor to the President, Jack McClure, finds himself in Moscow with the president and his family working on an important treaty when word comes that a senator has died in Capri. Strange thing is, this senator was supposed to be in the Ukraine. Sensing something is wrong, the president sends Jack McClure off to investigate. Before he can leave, a strange run in with a Russian woman named Annika stirs the pot and gives him a partner. Throw in the first daughter, Alli, deciding to tag along as well, and you have quite a mixed up group. Jack just didn't seem to do much for me. Perhaps it was the magical way his dyslexia gave him special thinking powers (not sure if that's possible or not, but it seemed an easy way out). Or perhaps how he always just seemed to get lucky. He really didn't seem to be making any headway on his own. It was all the work of Annika and Alli until the final mystery which he pulls a solution out of thin air. Annika is hard to describe. I didnt seem to get to know her very well at all. And what I did get to know about her always seemed to be changing. Alli was by far my favorite character. SHe was stronger than she thought she was. After being through a traumtic kidnapping (the first book) she has a lot of emotional baggage that she is working through throughout the entire story. I couldn't help but admire her tenacity as she tried to find herself again. The story itself was decent, but there was so much going on behind the scenes that without many strokes of luck our characters would have been dead several times over. I'm still trying to figure out how the ending really was the best solution to anything. I'm all for the surprise twist to keep the reader guessing, but there were a few too many this time. I won this book on goodreads first-reads giveaways. I've been trying to decide how I felt about the book once I was done for a couple days. I was excited to get this book because I like the Bourne-type novels, but hadn't read any of them. I figured that this would be a good book as well because I lived in Russia for a few years as a teenager and love plots that are centered around that area of the world. If I were basing my rating solely on the character development and the flow of the story, I I won this book on goodreads first-reads giveaways. I've been trying to decide how I felt about the book once I was done for a couple days. I was excited to get this book because I like the Bourne-type novels, but hadn't read any of them. I figured that this would be a good book as well because I lived in Russia for a few years as a teenager and love plots that are centered around that area of the world. If I were basing my rating solely on the character development and the flow of the story, I would have only given it a 2. The storyline itself was a great idea, but I never felt like the author really gave a clear picture of the characters we were following as we were going through the story. It got a 3 because I actually finished the book. If I finish a book, it must be intriguing enough for me to care what happens at the end of the novel. I found myself forcing myself to read as I went through the middle of the book-it just wasn't gripping enough for me to stay focused on the story. Character development was poor with many of the characters and I found myself getting confused on who was who for a good portion of the novel. 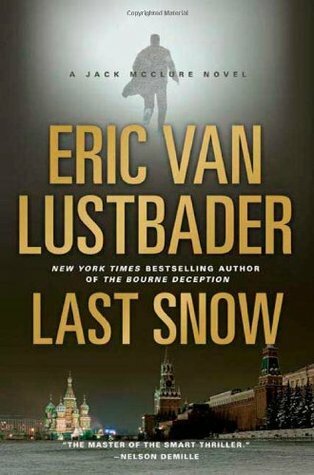 Eric Van Lustbader has written a bang up tale of espionage in "Last Snow". This is the second book in the Jack McClure series, and it sent me running to the library for "First Daughter". It is great as a stand alone, but I enjoyed it so much, I wanted more! American Senator, Lloyd Berns is killed by a hit and run driver on the Isle of Capri. Problem is he is supposed to be in the Ukraine. Jack McClure is a strategic advisor to the newly elected, President of the United States, Edward Carson. Jack Eric Van Lustbader has written a bang up tale of espionage in "Last Snow". This is the second book in the Jack McClure series, and it sent me running to the library for "First Daughter". It is great as a stand alone, but I enjoyed it so much, I wanted more! American Senator, Lloyd Berns is killed by a hit and run driver on the Isle of Capri. Problem is he is supposed to be in the Ukraine. Jack McClure is a strategic advisor to the newly elected, President of the United States, Edward Carson. Jack is dyslexic, but he sees things very clearly. The man has skills. Jack saved President Carson's daughter, Alli, from a kidnapper, and has the ear of the President and First Lady. Unfortunately, they don't seem to get the fact that he has a job to do, and they send their daughter with him, on his getaway plane. The President is in Moscow to sign an accord to put a stop to sales of nuclear goods to our enemies in the Middle East. It is a tricky deal, with crazy generals, criminals, and corrupt politicians. Throw a rogue Russian FSB agent, Annika (beautiful, of course), and Alli into the mix, and the bullets and sparks start flying. Though it was a little predictable, I found myself staying up most of the night to finish. The ending is huge, and leaves you wondering what will happen next! Yahoo! I am a Goodreads Winner, and more then ready to read this book by Eric Van Lustbader. At one time, I read a couple of "Bourne" books written by the original writer, and now find that Eric Van Lutbader is picking up the theme and marching forward with the character! Excellent. What a ride! 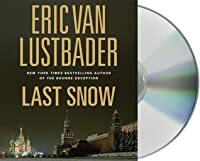 Eric Van Lusthbader’s book “Last Snow” takes the reader into the world of espionage, and we are not on cruise control as we move into politics, travel to Russia, and learn the tale of two worlds colliding Yahoo! I am a Goodreads Winner, and more then ready to read this book by Eric Van Lustbader. At one time, I read a couple of "Bourne" books written by the original writer, and now find that Eric Van Lutbader is picking up the theme and marching forward with the character! Excellent. Interesting to be reading this book, that mostly takes place in Russia, as the Olympics begin in Sochi. Especially as the stories about corruption, lies, criminality et al fill the newswires. Oh wait, that's the same as this book. Hmmmm. Struggled with all the Russian people & place names, and keeping the many players straight, which detracts from understanding the story 100% but made it to the end nonetheless. Speaking of the end, was disappointed and let down with this one. Wonder why Lust Interesting to be reading this book, that mostly takes place in Russia, as the Olympics begin in Sochi. Especially as the stories about corruption, lies, criminality et al fill the newswires. Oh wait, that's the same as this book. Hmmmm. Struggled with all the Russian people & place names, and keeping the many players straight, which detracts from understanding the story 100% but made it to the end nonetheless. Speaking of the end, was disappointed and let down with this one. Wonder why Lustbader choose to end this way? Not necessary to read "First Daughter," which is the precursor to this, but it does help make sense of the relationship between Alli & Jack. Love the idea of the character dyslexic Jack, but found some of his connection making weak and hurried. Found Alli to be acting like a spoiled brat one minute and a seasoned investigator the next. Not sure how that works. Eric Van Lustbader's send book in the Jack McClure series is a step up from his first book The Last Daughter. This thriller takes place in Russia as Jack accompanies the President travels to Moscow. Jack is the Presidents closest ally and confidant. Jack makes a split second decision to get involved with defending a Russian Woman and is drawn into what could become an international incident. When the President's Daugter is left in his custody he must protect her while solving a mystery before the Eric Van Lustbader's send book in the Jack McClure series is a step up from his first book The Last Daughter. This thriller takes place in Russia as Jack accompanies the President travels to Moscow. Jack is the Presidents closest ally and confidant. Jack makes a split second decision to get involved with defending a Russian Woman and is drawn into what could become an international incident. When the President's Daugter is left in his custody he must protect her while solving a mystery before the President signs a new agreement with Russia. It is a mile a minute thrill ride and Richard Ferrone does an amazing job with the characters in this series. As an advid audiophile I appreciate a narrator who stays with a series from book to book. This is a great book to listen to and I am excited to start the next book in this series. I bought this book for my own pleasure and provide this Honest Review for my readers.